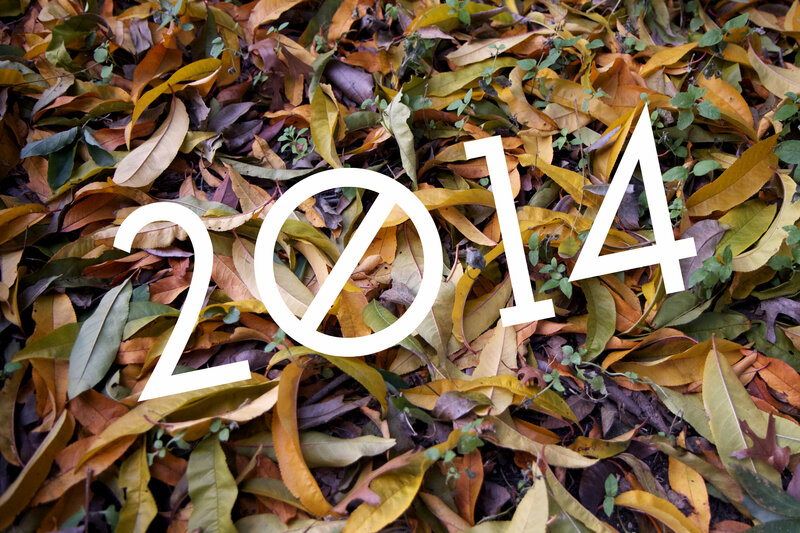 Let’s take a look back at 2014, shall we? 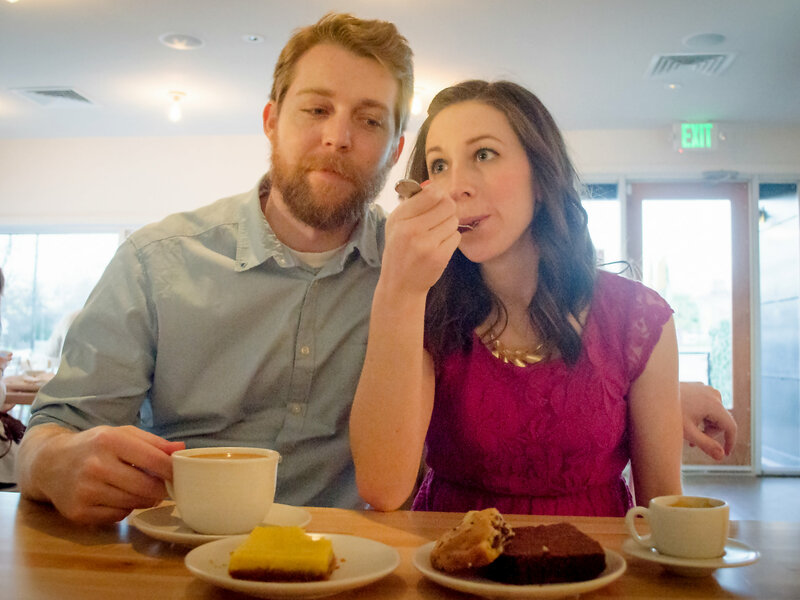 At the beginning of 2014, I started a little weekly photo challenge for myself. I wanted to practice using my camera, and take lots of photos every week. I went strong for 22 weeks, then just…stopped. I got a little burned out, and needed a break from the camera. In 2015 I’m aiming to take lots of photos again, but not on such a strict schedule. Less stress, ya know?! Probably the biggest moment of 2014 was buying a house in March! I hope to do an updated house tour soon, now that we are all settled in. All you’ve seen are the empty rooms! 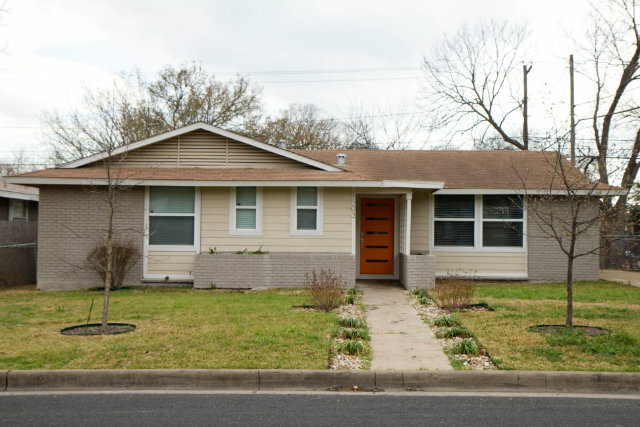 Seems crazy that we’ve already made it our own style and gotten so attached to our little house. In March, I my first traveling of the year to Kentucky to see my sister and her family for her birthday. 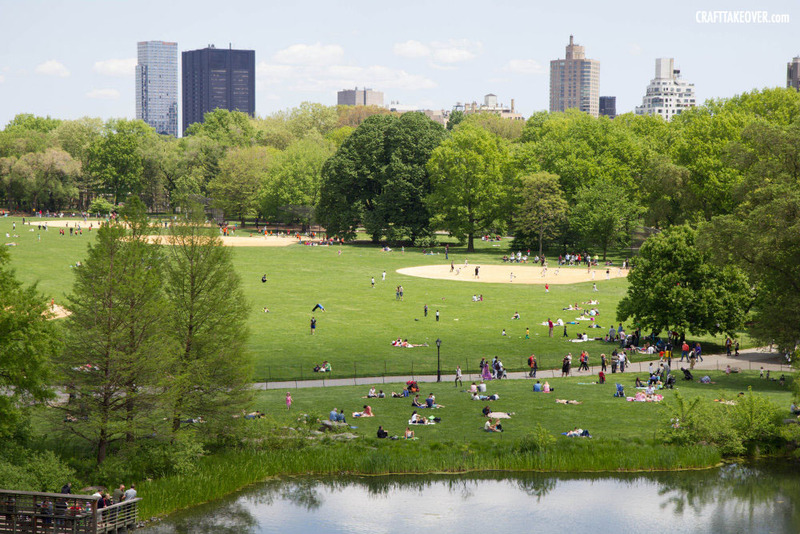 Then in May we went to NYC! John and I spent our one year anniversary here, and we had the best time. I’d like to go back…tomorrow. Ok? Thanks! 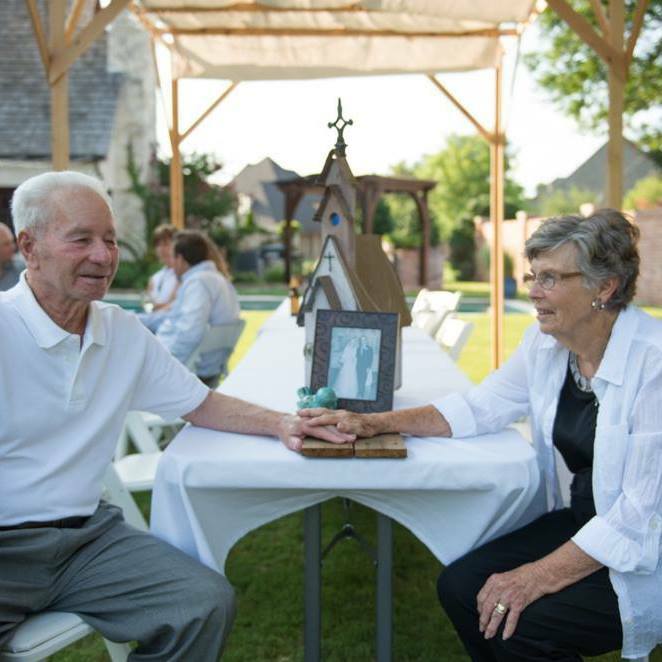 We also took a quick trip to Oklahoma to celebrate my grandparent’s 60th wedding anniversary. I tear up just thinking about how much love they have for each other and for their family. It was a super special evening celebrating these two. Aren’t they cute? P.S. I can’t take credit for this amazing photo! Aunties, do you know who I can credit? 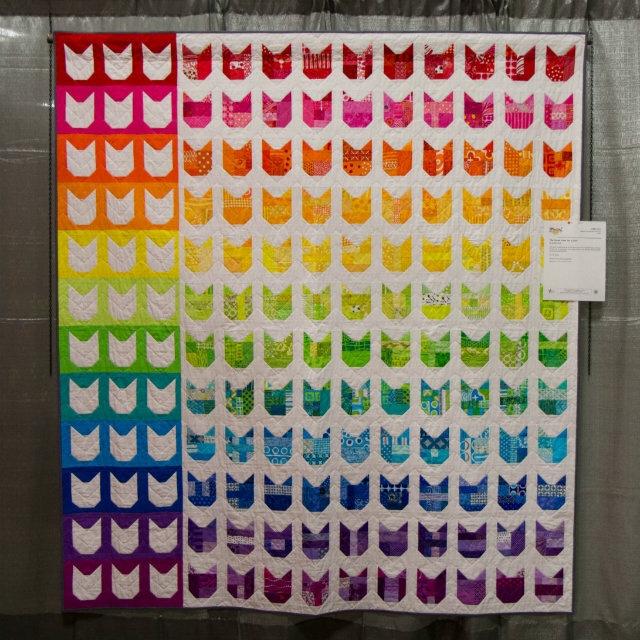 Halfway through 2014, I decided to enter a quilt in my very first quilt show! 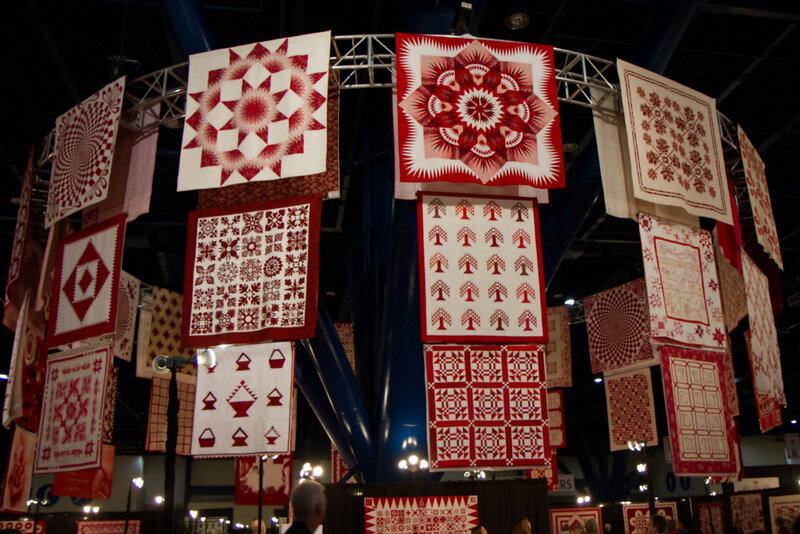 The Capital of Texas Quilt Fest. Seeing my quilt hanging up there with the rest of the amazing works of art was the best feeling. In 2015 I’m going to try and finish my latest quilt and enter it in another show. Details soon, I promise. My first quilt show entry. Oh and I joined a quilt bee! And I didn’t even tell you! How rude of me. I’m part of the “Sew Together” bee here in Austin, and we meet once a month to talk about art quilts and modern quilting. I’ve met some lovely ladies and am excited to learn and get inspiration from the group. Not only did a join a quilt bee, but I also became a member of the Austin Modern Quilt Guild. I joined in October, and am slowly getting to know everyone. I love being a part of this group of like-minded quilters! I get to geek out about sewing and quilting, and I’m excited to attend more meetings in 2015. More quilty things: Halloween was awesome because I went to the International Quilt Fest in Houston. My brain melted. The next night John and I got all dressed up and went to our friend’s awesome Halloween party. 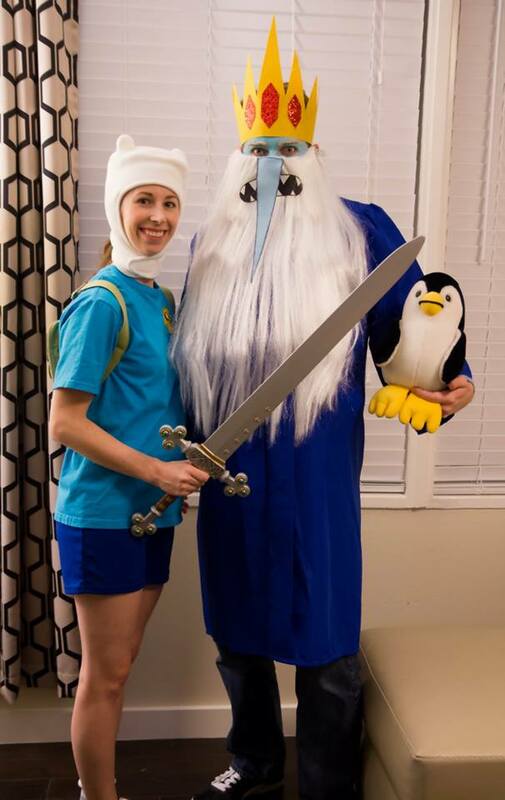 Bonus points if you know who/what cartoon we are from. I also opened my Etsy shop in 2014! I have just a few things listed so far, and I have been aiming to get even more items up in the next month or so. I’m really enjoying working on my shop, and I’m learning a lot. The holidays were nuts around here. 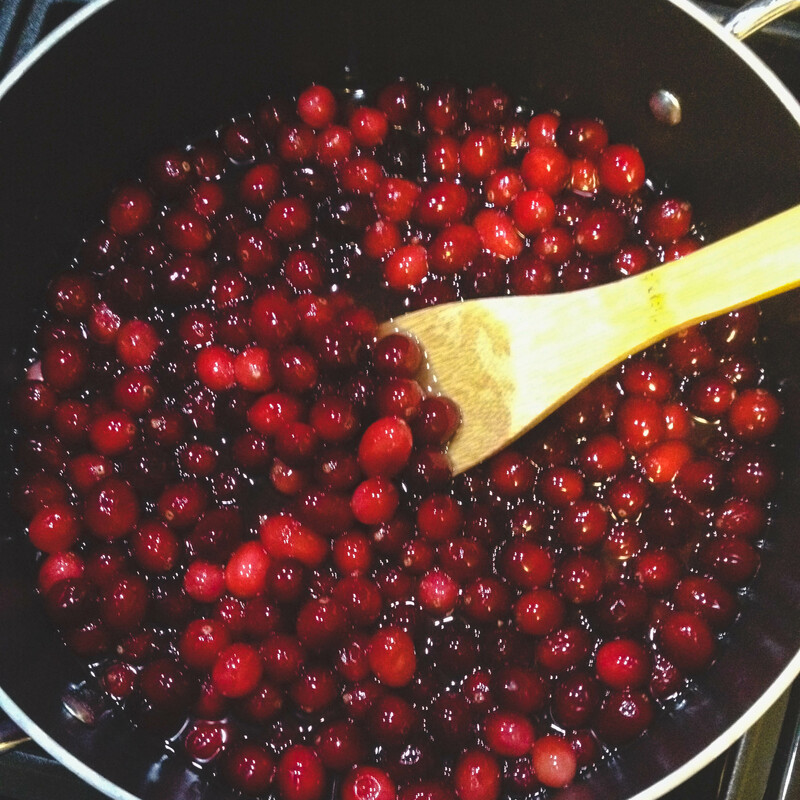 It seems like the last few months flew by, and I don’t even have ANY pictures except this one of cranberries. We hosted my parents for Thanksgiving, and I did a really bad job at making turkey. But the sides were DANG GOOD! We spent Christmas day in Austin, then traveled to Wichita Falls to spend time with John’s side of the family. Lots of fun and food and family time. 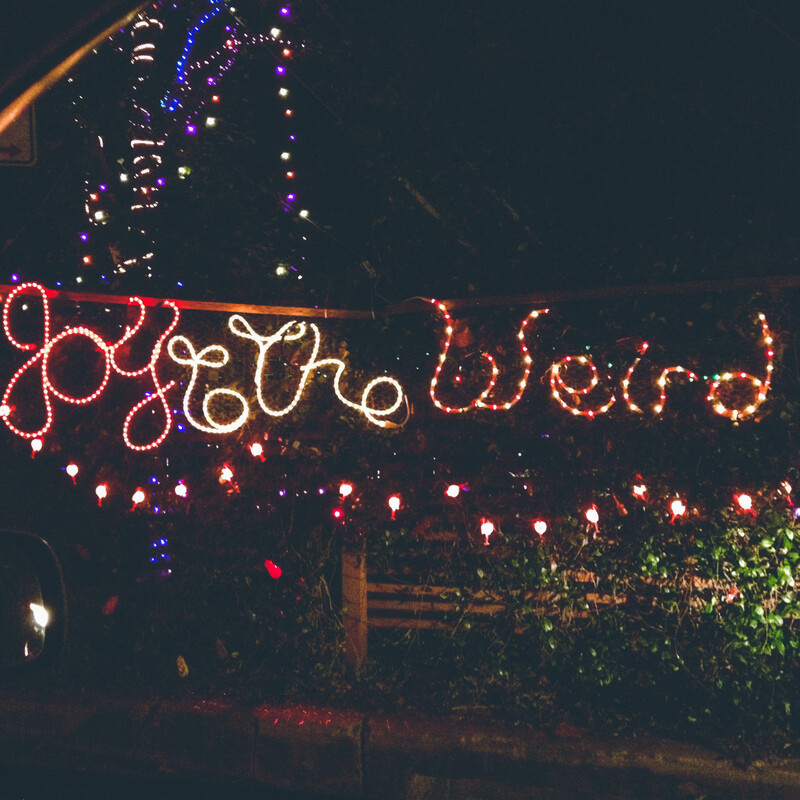 Christmas lights in typical Austin fashion. Finally, we toasted to 2015, and said goodbye to 2014. 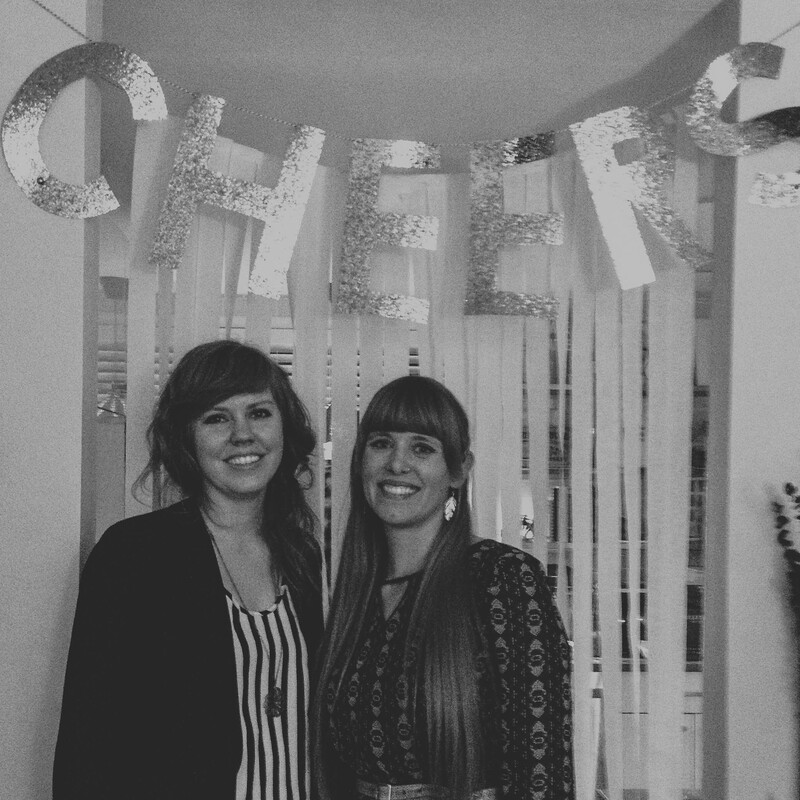 We hosted a New Year’s party at our house, and it was a lot of work, but it was even more fun. I made a glitter CHEERS sign and everything. And that’s a wrap. If you made it to the end of this post, I owe you a cookie. I liked you, 2014. I liked you a LOT. But I’m ready for more adventures and crafts and sewing and reading and writing and eating. I think 2015 will be just right. Just popping in today to share a few things I’ve been working on lately. First things first. I made my first sale on Etsy! I quietly opened up shop a couple months ago, and am hoping to sell some cute coasters, pillow cases, and all sorts of other fun fabric goods I dream up. 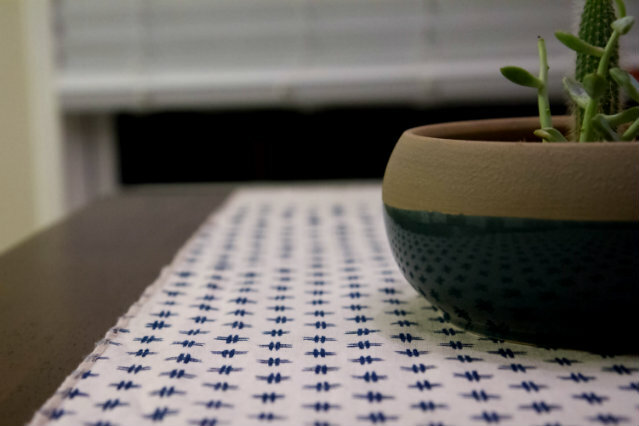 We recently got a new dining table and chairs, and I thought my new Japanese fabric I purchased in Houston would make a great table runner. These indigo crosses make me happy every time I look at them! 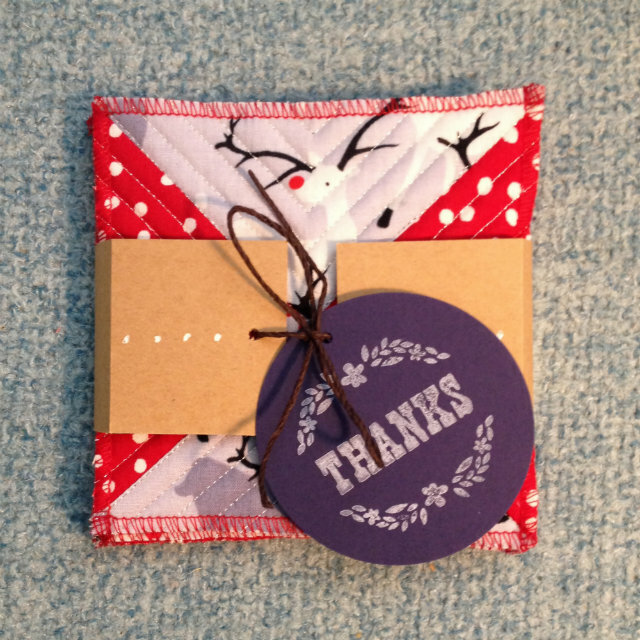 And another fun table/dining room project – these Thanksgiving napkins I whipped up! I like the subtle fall colors and fun leaf print. Next on the agenda: Christmas napkins. Soon I’ll have napkins for every season. 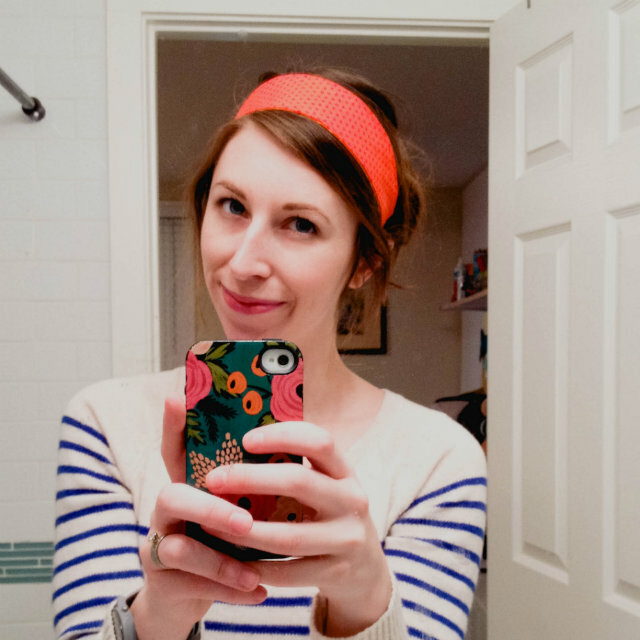 Stepping up my hair game with a homemade reversible headband. I LOVE how these are turning out. (I’ve already made three in the last two days.) I think I may list some on my Etsy shop, too. They are too good not to share! I finished a quilt top for John! 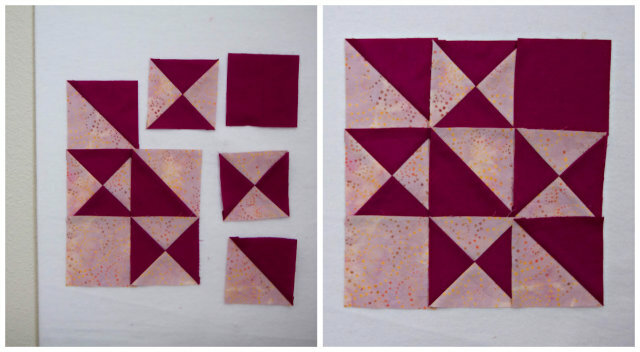 This simple half-square triangle design came together really quickly, and I can’t wait to get started hand-quilting it. What are you working on lately? I’d love to hear! On Halloween, I took the day off work, and drove myself down to Houston so I could check out the International Quilt Festival! I spent about 6 hours at the festival, and quickly learned that only one day spent there is not nearly enough time to see everything! 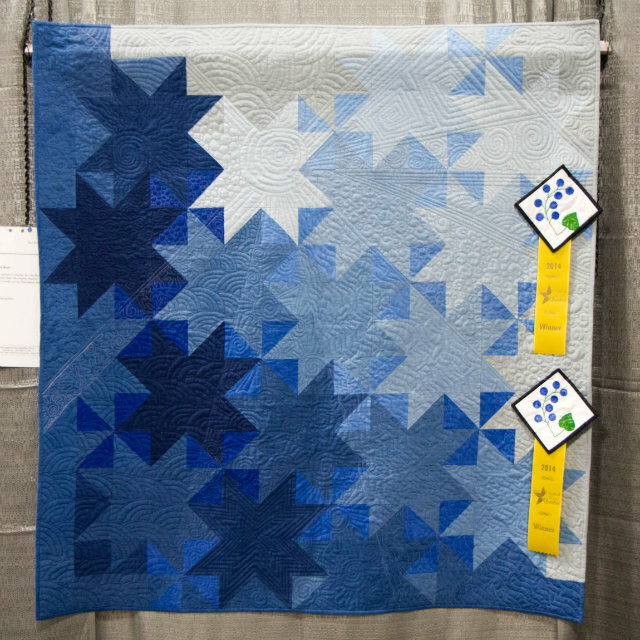 I spent most of my time just walking around and seeing the beautiful quilts, and checking out the many, many (as in, over 1,000) vendors selling all sorts of quilty things. 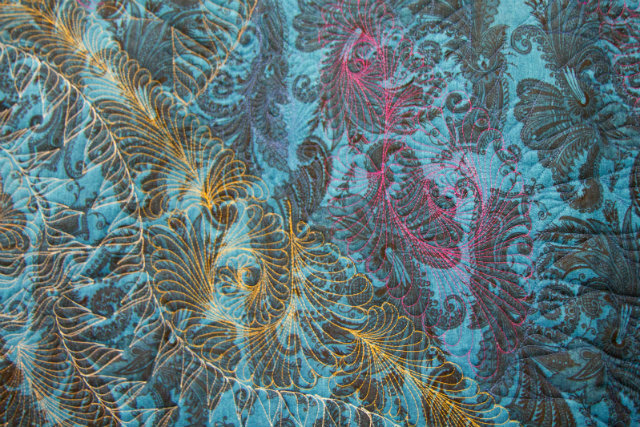 Fat quarters from Web Fabrics. Half yard cuts from Heartway International. 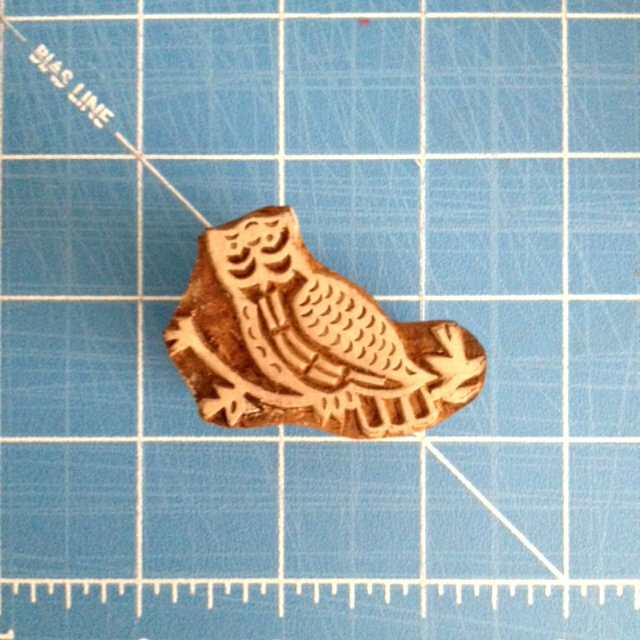 And this cute owl stamp from Country Keepsakes. 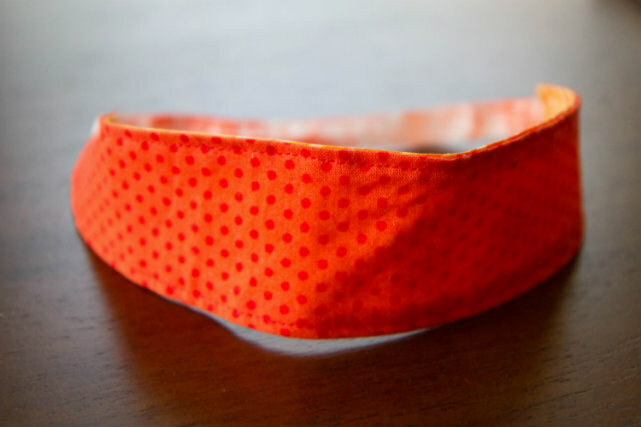 I had also heard some great things on Molli Sparkle’s blog about Bloc Loc rulers, so I was excited to come across their booth…but unfortunately they were all sold out of the two sizes I was considering! I think I may have to order one online. 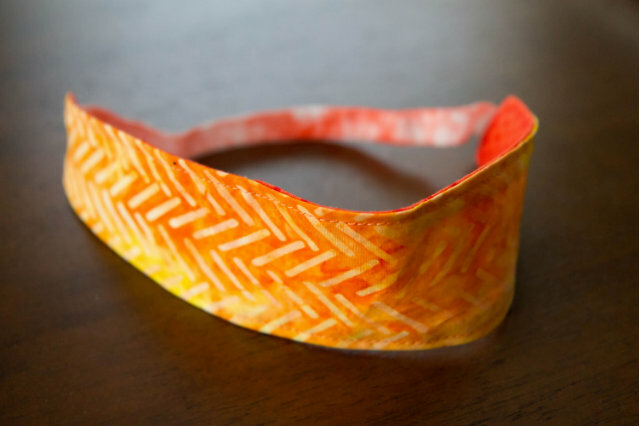 I often find myself needing to square up blocks, and this seems like the perfect tool! 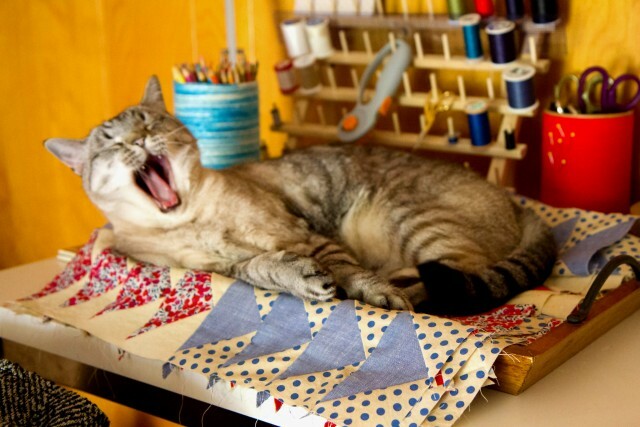 Now, let’s move on to the amazing quilts! I’ll just jump right into it with the photos. I picked a few of my favorites, and listed them under their specific categories. This is a special exhibit to celebrate the festival’s 40th year. The photo at the top of this post shows how they were beautifully displayed. I couldn’t see the quilt labels for these, so I’m not able to credit the artists. Don’t you just love when autumn rolls around and you get to start buying pumpkins and candles and Halloween decorations? This year I thought I’d spruce up my kitchen table a bit with some fall colors. The remnants of Cherrywood fabric I had leftover from my chevron pillows was the perfect fit for an easy table runner! 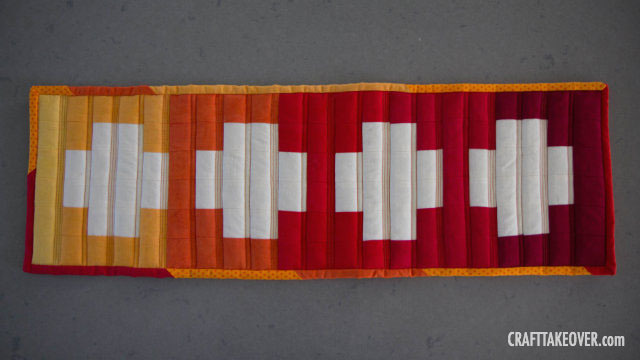 The quilted table runner is made up of two inch squares from 6 different variations of red, orange, and yellow. I made up an easy-to-piece cross pattern that reminded me of my very first quilt, and it came together really quickly! 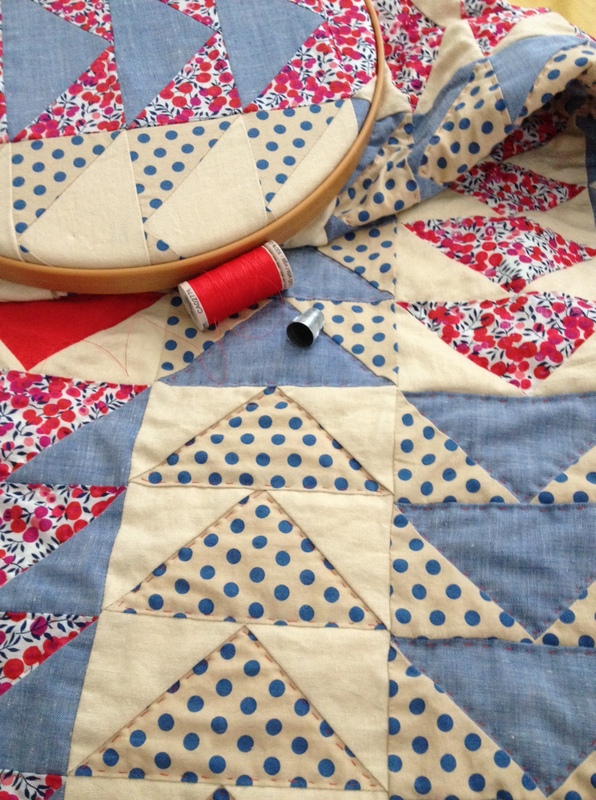 I loved making it because I got to work on my piecing and quilting skills, without having to make a huge project. 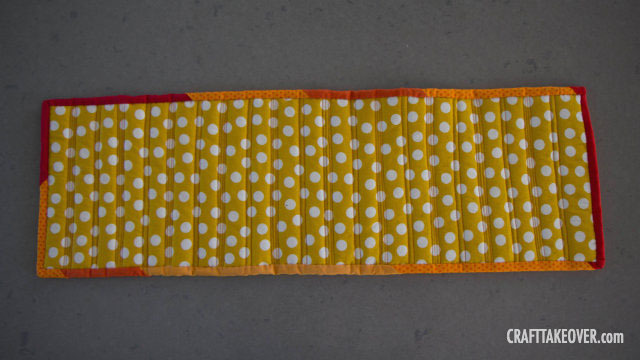 The fabric on the back is also from my stash – you may remember the yellow polka dot pillows I made with this fabric a couple years ago. 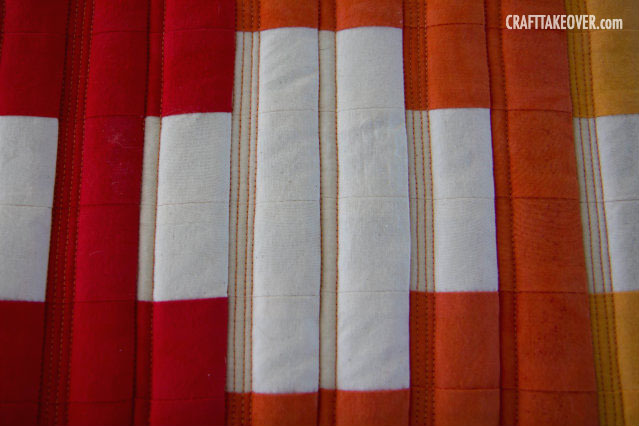 Once I basted the layers together, I did some easy straight-line quilting with my little sewing machine, alternating between quilting two lines and four lines of simple orange thread. The binding is also pretty scrappy, using up more Cherrywood reds and oranges, and a little more polka dot fabric thrown in for good measure. I love these intense colors! 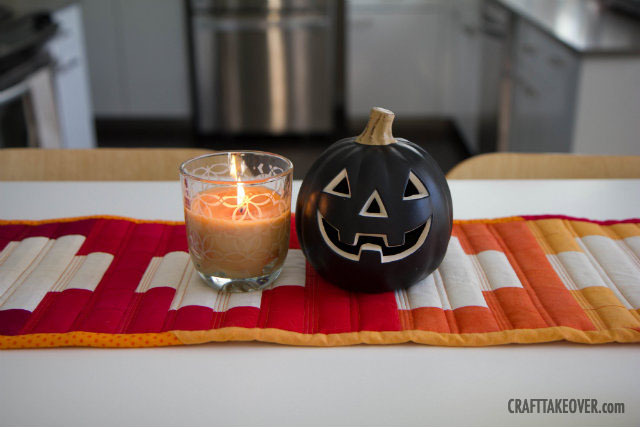 What an easy way to brighten up a table for the fall season. Hope you have a fun and spooky Halloween next week! Did you know that fabric sticks to flannel? This never really occurred to me until I saw some awesome sewing and quilting studios that incorporated a design wall into their space. 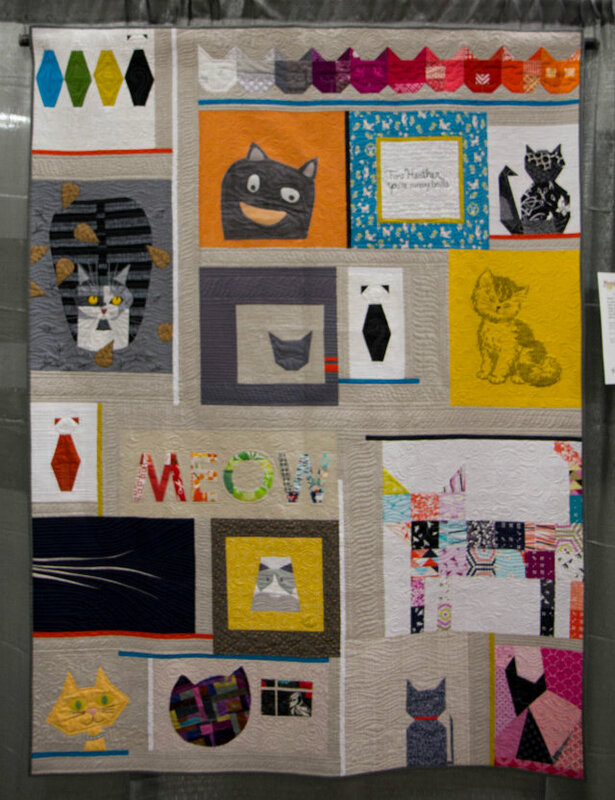 A design wall allows you to to lay out fabric and play with quilt blocks until you find the perfect arrangement! It’s a super helpful tool when laying out a design for your next project. 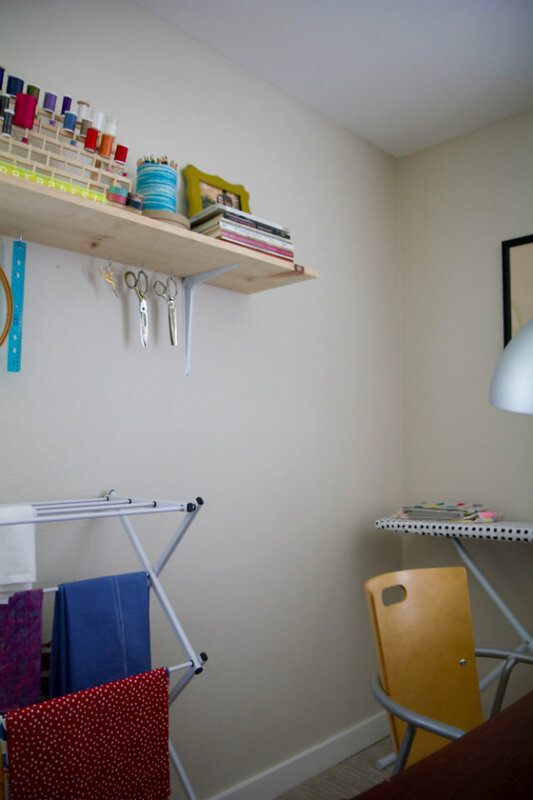 Here’s a couple of shots of my sewing space before. I knew I needed something in the far corner, but I didn’t know what to put there. Once I started thinking about a design wall, I knew it was the perfect place! 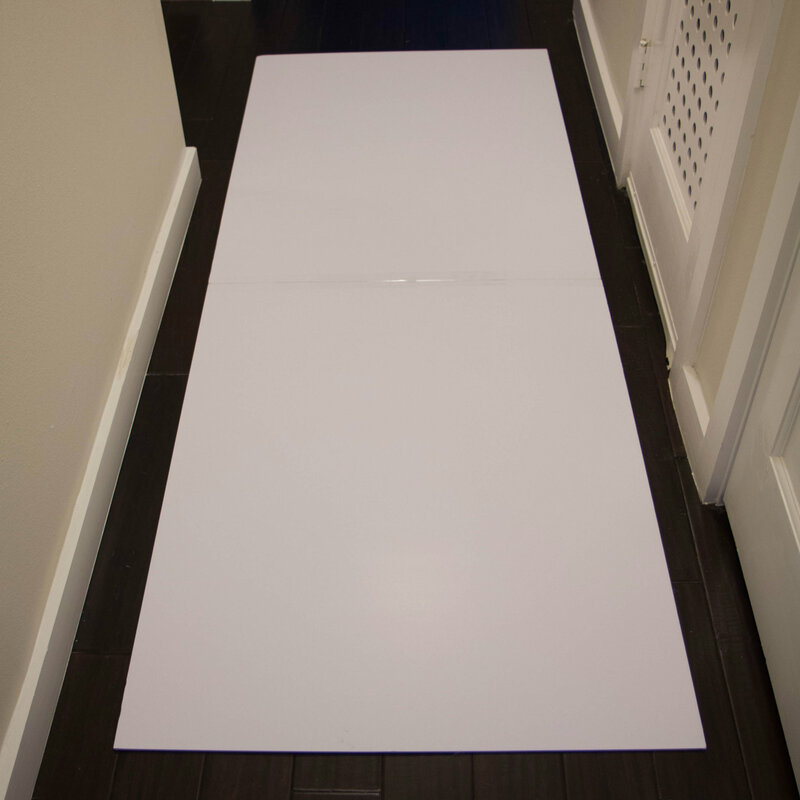 foam core board – found at craft or office supply stores. 1. First, measure your space to see what size design wall you can make. I had a long narrow corner of the wall that I wanted to utilize, so I used two foam core boards stacked on top of each other. I found mine at Hobby Lobby, and they were 32 x 40 inches each. 2. Next, determine how much flannel you need to cover your board. My design wall is about 7 feet tall, so I bought 2 and half yards of flannel. 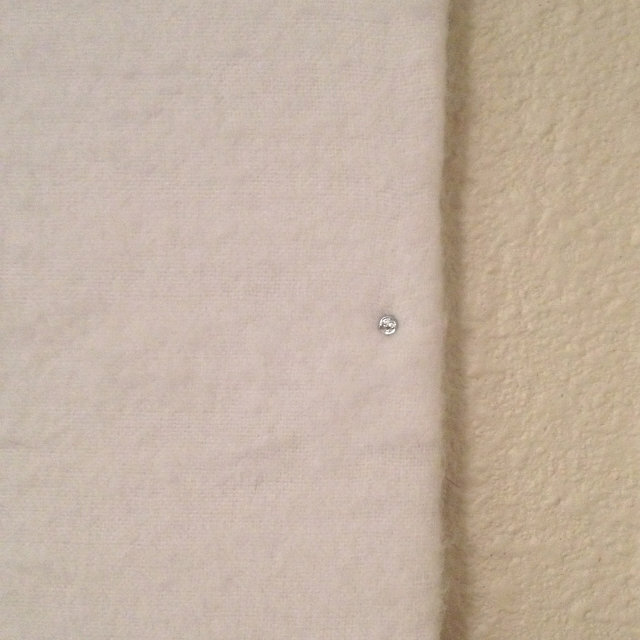 If you are making a wall that is wider than the flannel, simply sew a couple of pieces together to fit. 3. Tape the foam core boards together. 4. 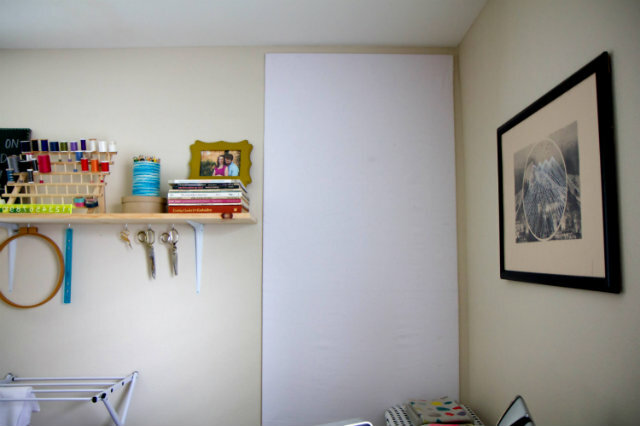 Attach the flannel to the board by pulling it taught, and stapling around the edge with a staple gun. 1/4 inch staples worked well for me – do not use long staples or you’ll go all the way through the board! If you have a wider board, some spray adhesive may be helpful during this step. Cut off the excess fabric on the back. 5. The foam core board and flannel are so lightweight, I simply nailed through all four corners and in the middle of both sides to hold it in place on the wall. 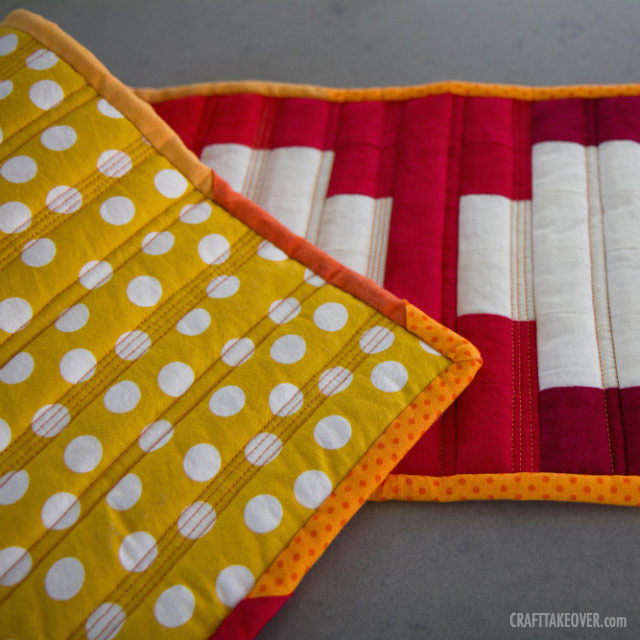 It is so, so helpful as a quilter and sewer to be able to simply stick some fabric or block on the wall, and then be able to rearrange and move them around. It really helps you perfect your design! You guys know I love some quilt inspiration. 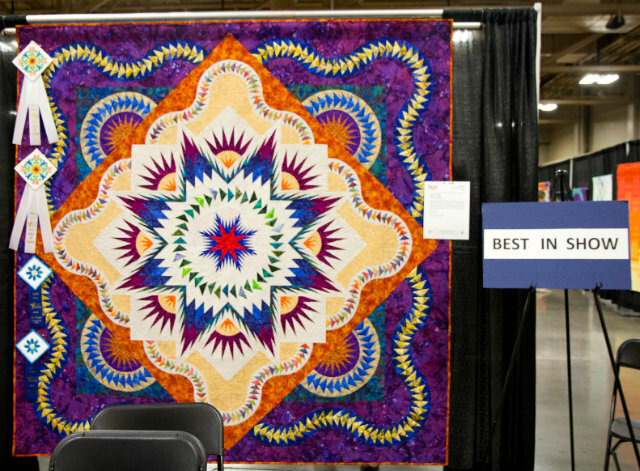 So of course I had to share more inspiring quilts from last weekend’s Capital of Texas Quilt Fest here in Austin. 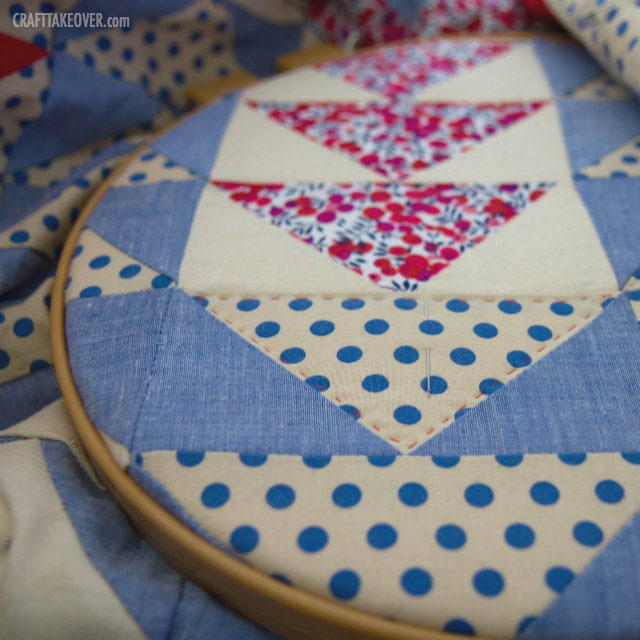 It was hard to pick only 10 quilts to share…but any more and I would have had WAY too many photos overloading this post. So 10 quilts it is. These are in no particular order, other than the order I walked around the fest. First, we have the winner of Best in Show! Over the Edge, by Joseph Stroman. Isn’t it so amazing?! 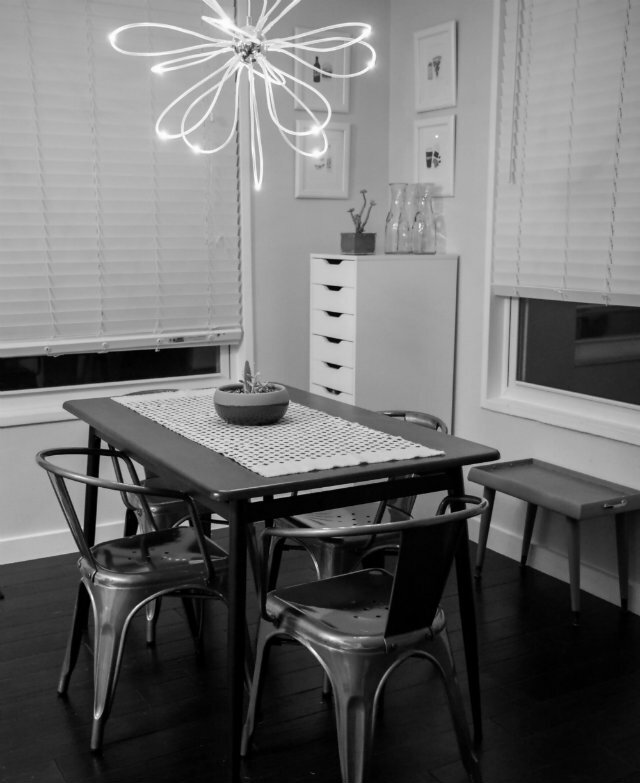 The photographs don’t do it justice (especially with those chairs blocking your view!). Just take my word for it, it was spectacular. Check out how the quilting thread jumps out at you on the back. I loved the colors. Delicious Mountains, by my friend Rebecca Salinger. She won Judge’s Choice, go Rebecca! Again, I didn’t do a great job with this photo, so it’s a little tricky to see, but the embellishments were really neat. I love art quilts, and this is such an inspiring example of one. Balancing Act, by Art Bee Austin. Isn’t the hand painting on these rocks amazing? Feral Cats, by Kathy York. I’ve posted about some of Kathy’s work before in this post, but I continue to be inspired by her work every time I see it. Plus…I love cats! See? More cats! 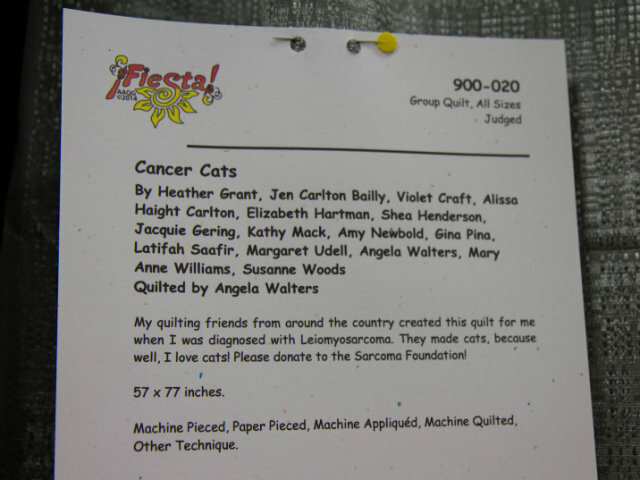 This one is called Cancer Cats, and it was made for Heather Grant. Make sure to read the description in the photo below. I love the friendship behind this quilt. 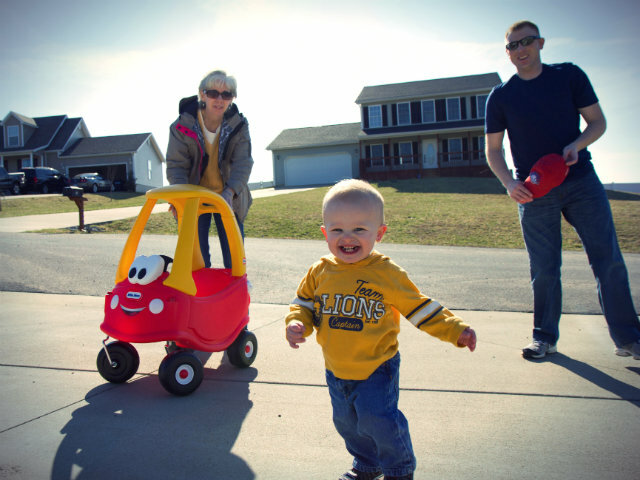 Learn more about the Sarcoma foundation here. 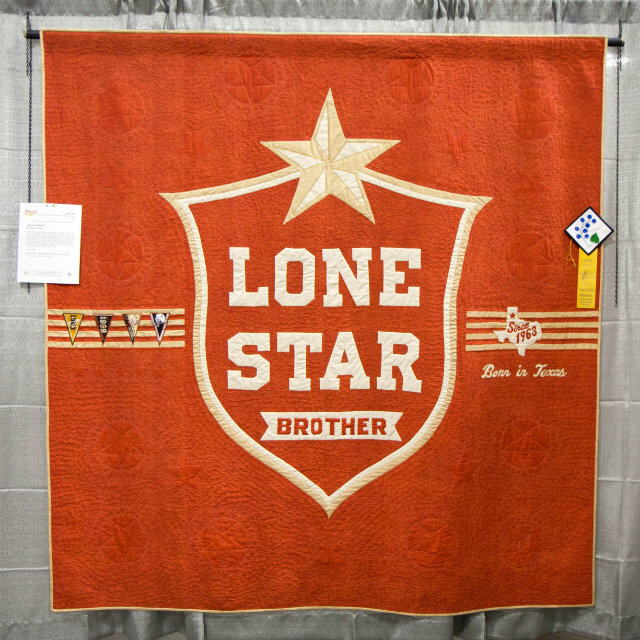 For the beer lovers out there…this one is called Lonestar Brother, by Marilyn J. Roskey. 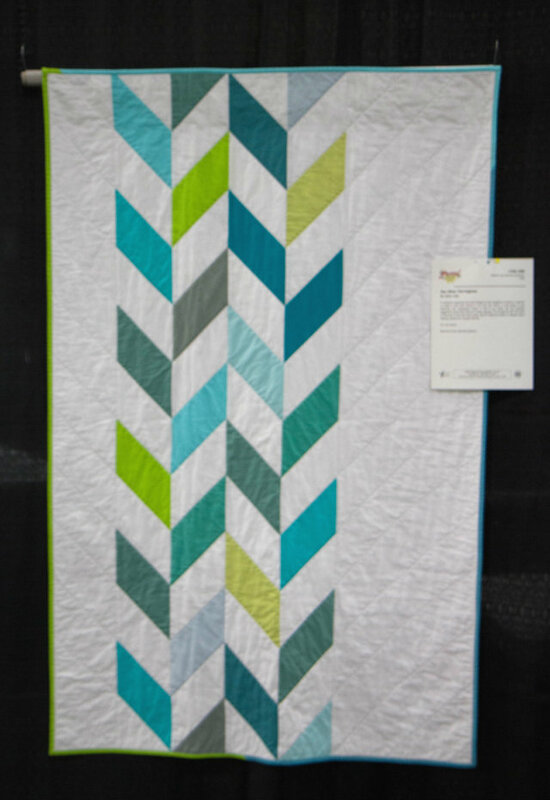 Sea Glass Herringbone is a quilt by my friend Claire Jain. 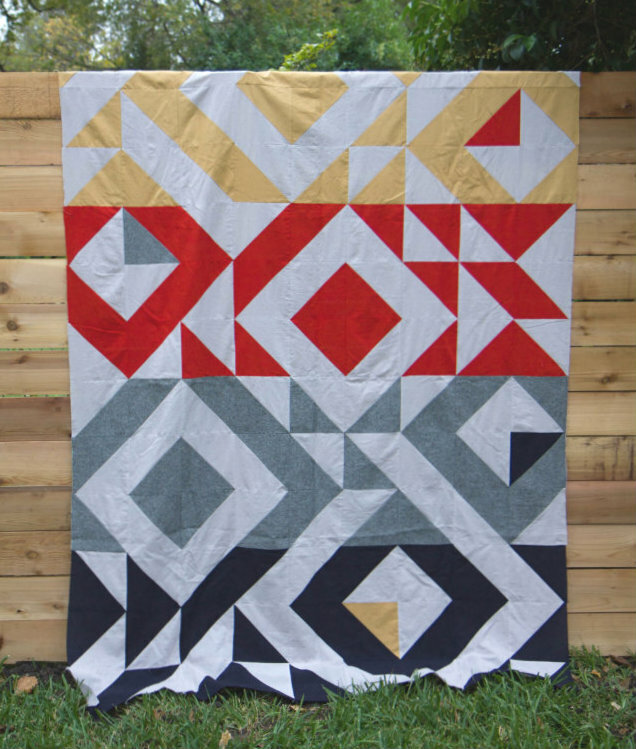 This quilt was featured in a book I mentioned just the other day in my Recent Reads post – Lucky Spool’s Guide to Modern Quiltmaking. I haven’t made it all the way through the book yet, so I was super pumped to find out her quilt was in it. Congrats, Claire! Your quilt is beautiful. 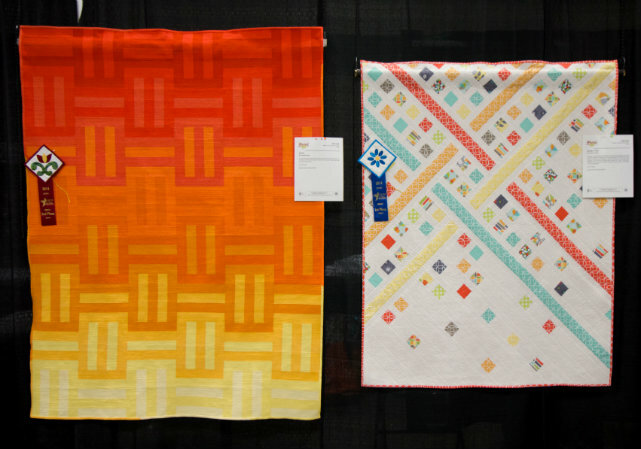 I loved both of these quilts by Corinne Sovey. On the left is Waves (you can find her awesome tutorial for this quilt right here), and on the right is Garden Trellis (you can purchase her pattern here). 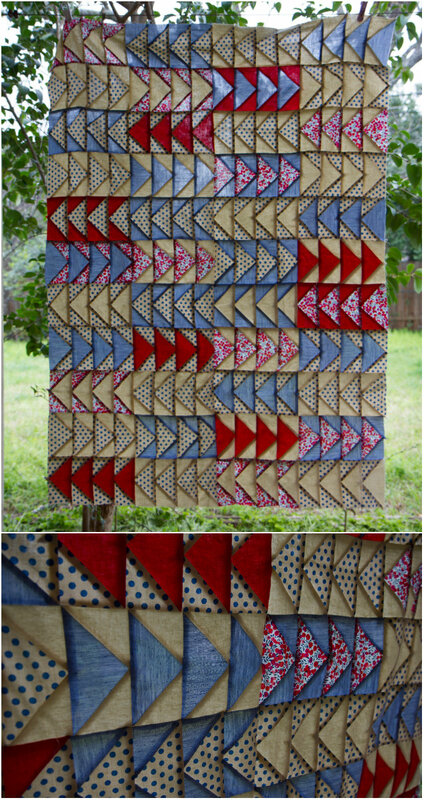 I am finding that I am more and more drawn to modern quilts, and these by Corinne are super inspiring! Here is Twilight Stars, by Linda Scheible. I really like the color gradations on this one. And you know my obsession with Cherrywood fabric, which made me drawn to it even more! And finally, Swoon by Stacey Napier. These blocks are awesome, and I really like the fabrics she chose. 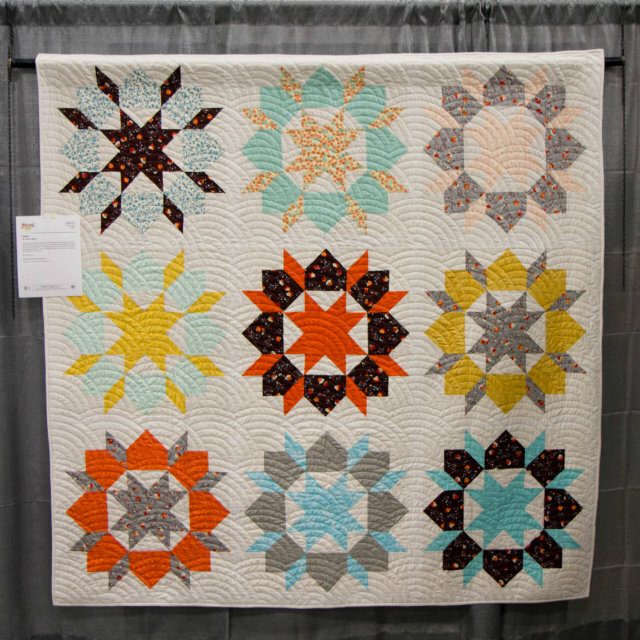 She has a lovely post on her blog about this quilt if you want to read more. Oh yeah, last but not least – I didn’t count my quilt in the 10 shared here. But I better show you guys the finished product, since I talked so much about it in my last post. 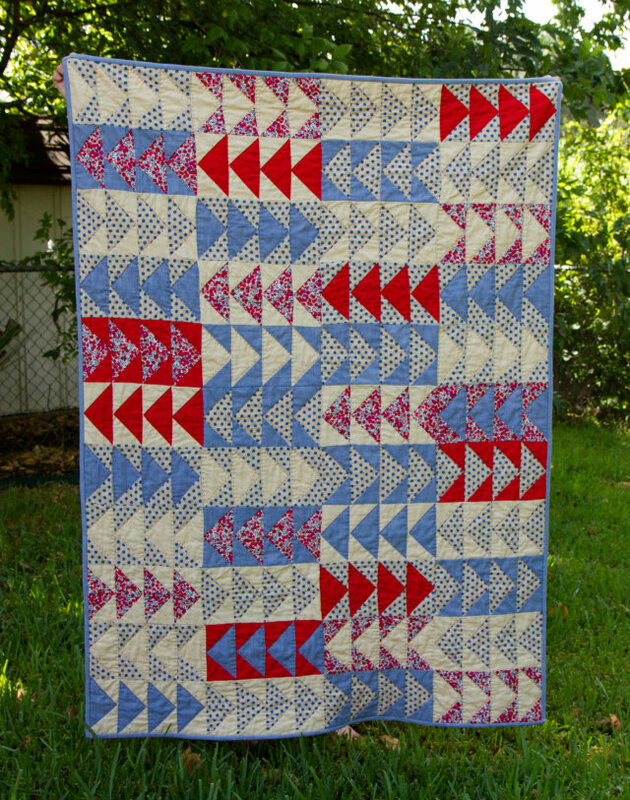 Liberty Geese Number 3 is my first quilt entered in a show, I’m so proud! I’ll take that Honorable Mention any day. Here are a couple more shots of the front and back with better lighting out in my backyard. 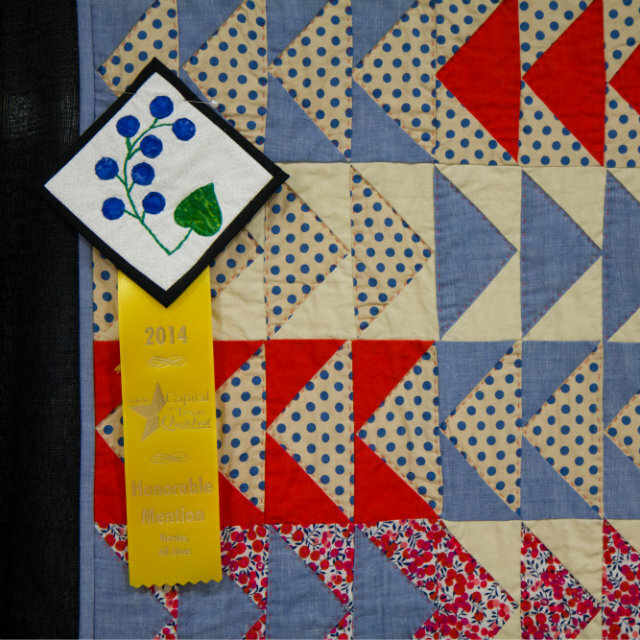 Hope you enjoyed seeing some of the quilts from this year’s show! Click here to see some of my favorites from 2012. This year, not only am I attending, but one of my quilts will be on display in the show! 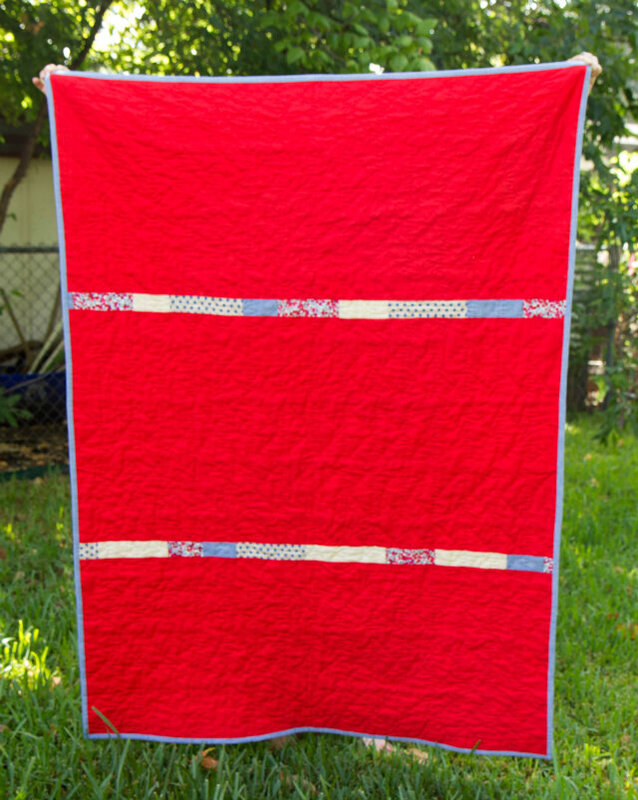 I joined the Austin Area Quilt Guild, and entered my latest quilt in the novice category, as this is my 3rd quilt to make. I’m excited and looking forward to the show. 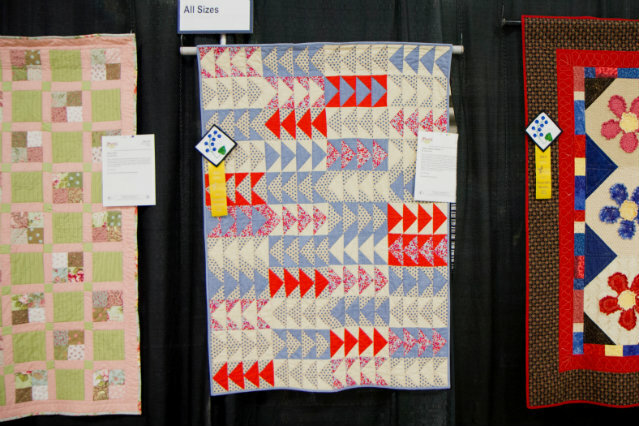 I hope that some of you Austin folks will make it out to see all the lovely quilts on display – there will be over 350 quilts there! Here are a few sneak peaks of my quilt, which I’ve shown progress shots of earlier this year. I’ll reveal the finished quilt when I get the binding on, and after it’s all fancied up and hanging at the show! 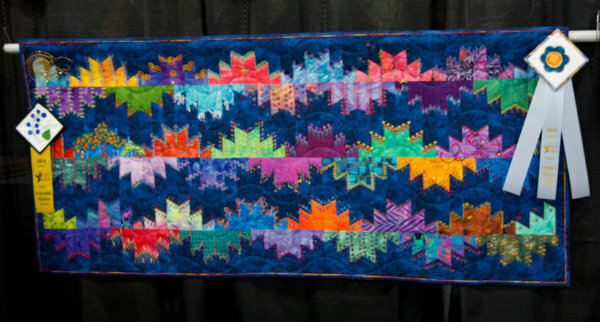 I can’t wait to see all the lovely quilts and check out a few of the demonstrations. Some of them that sound really interesting and informative: Art Quilts, Quilt Preservation and Restoration, Quick Basting Techniques, and Basic Free-Motion Quilting, plus a bunch more!